Background: Universities operate in an increasingly competitive and regulatory driven environment in which cost-effective, sustainable delivery of quality courses is critical. Sector-wide efficiency requirements makes it imperative to share resources, expertise, and practices in quality enhancement (QE). Aims: This paper presents a literature review developed to answer two research questions: 1) What resources, expertise and practices related to QE of teaching and learning are in the public domain? 2) What barriers and enablers exist that would help inform strategies to implement a QE system? Results: The literature review uncovered five main themes and associated findings in regards to Quality in Higher Education (Table 1.). A CoP explored their own teaching contexts and through evidence based discussions, shared resources and the literature developed a common understanding of Quality in Higher Education (Figure 1.). Discussion: The literature review (Table 1. ), in conjunction with discussion and reflection between the members of a CoP, informed Quality Pursuit’s (360QP) philosophical stance and the community’s evolution. At its heart, 360QP is a grass roots approach to Quality Enhancement (QE) aimed at improving learning and teaching at the critical intersection of learner and teacher. It originated out of a CoP of academic teachers and professional staff that had a shared domain of interest in improving their teaching practice through sharing QE tools and resources. Using social learning, community engagement and brokering, this CoP of UTAS subsequently expanded into a national team currently comprising some 22 members, five institutions, and two professional bodies. A collegial approach of dialogue and discussion, building leadership capacity and purposefully acting to support cultural change continues to be emphasised. 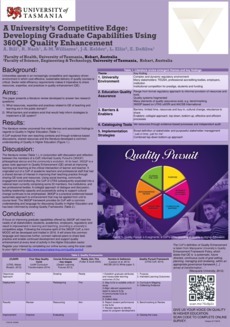 360QP is a practical evidenced-based systematic approach to enhancement that may be applied from unit to course level. The 360QP framework provides its CoP with a common understanding and language for discussing Quality in Higher Education and has been informed by existing Quality Frameworks. Conclusion: A focus on improving graduate capabilities offered by 360QP will meet the needs of all stakeholders (students, academics, employers, regulators) and result in improvement in learning and teaching, providing a university’s competitive edge. Following the inclusive spirit of the 360QP CoP, a miniMOOC will be developed and trialled in 2016. It will share this common language and resources further, connect national peers to share best practice and enable continued development and support quality enhancement at every level of activity in the Higher Education sector.